His Majesty King Hamad bin Isa Al Khalifa is the eldest son of the late Amir of Bahrain, Shaikh Isa bin Salman Al Khalifa. 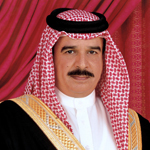 H.M. the King was born in Riffa on January 28, 1950, corresponding to Rabe'a Al Awal 7, 1369, on the Hijri calendar. At the age of six, he began his primary education in Bahrain in addition to reciting the Holy Quran and studying the principles of Islam and the Arabic language at the hands of professionals in the field of Islamic studies. This education had a positive impact on his mastering of Arabic and his appreciation of Arabic poetry, especially Nabati and Bedouin poetry. His Majesty was keen to attend the Majlis (open court sessions with the people) of his late father to listen attentively to traditional stories and legends about heroes, nations, incidents and factors that contributed to victory or resulted in defeat. His Majesty the King also expressed keenness to learn swimming, horse riding and target shooting from expert trainers, which had a major influence in planting the seeds of his interest in sports and his patronage of sportsmen. In 1964, following the completion of primary education with honors, H.M. the king was proclaimed Crown Prince on June 27, 1964. He completed his secondary schooling from Leys public school in Cambridge, England, returning to Bahrain in the summer of 1967. He joined the Mons Officer Cadet School at Aldershot in England graduating on September 14, 1968. He also studied at Sandhurst Academy. On his return, H.M. the king played an active role in preparing the outline of the Bahrain Defense Force (BDF) which was bolstered by an Amiri Charter issued in August 1968 that created the BDF. H.M. king Hamad married his cousin on October 9, 1968, a union which bore him H.R.H. Shaikh Salman on October 21, 1969, H.R.H. Shaikh Abdullah on June 30, 1975, H.R.H. Shaikh Khalifa on June 4, 1977, and H.R.H. Shaikha Najla on May 20, 1981. H.M. was appointed head of the Defense Directorate and became a member of the State Council which was established on January 19, 1970. He became Minister of Defense on August 15, 1971, when the Cabinet was formed and continued holding the post until the formation of the current Cabinet. On June 21, 1972, H.M. the king joined the US Army Command and Staff College at Fort Leavenworth, Kansas, the United States of America. He was awarded the Freedom Medal of Kansas City from the Mayor and people of Kansas City. He attained the National Diploma in military administration on May 31, 1972, from the Industrial College for the Military Forces in Washington. On June 9, 1973, he graduated with honors from Fort Leavenworth with a degree in leadership. He was awarded the military honor certificate from the United States of America for his achievements in military affairs since 1968 and his name was enlisted in the college's lieutenant honors list. After his return from the US, H.M. the king took active part in the country's development and expansion process in general and the BDF in particular. His efforts covered various fields including the culture, sports, military, technology and health sciences. On June 26, 1974, H.M. the king was appointed deputy to the Head of the Al Khalifa Family Council following an Amiri decree issued in this context. In January 1978, H.M. the king ordered the establishment of the Historical Documents Centre which he housed in his Court. This had great impact in the development of the Centre, which continued in its work of gathering pictures and documents from various countries, publishing them in the center’s Al Watheqa magazine. His Majesty’s interest in sports and youth was enhanced by his appointment as President of the Supreme Council of Youth and Sports in 1975 with Amiri decree No 2. H.M. the King has always shown interest in sports, especially horse riding. His keen interest in Arabian horses caused him to establish the Amiri stables in June 1977 which was registered in the World Arabian Horses Organization in September 1978. H.M. the king has always emphasized the importance of bolstering scientific research and technology, coordinating such activities in the service of Bahrain. These activities were given a boost with the establishment of the Bahrain Centre for Studies and Research in1981 and his heading of the BSCR. Since his teenage years, H.M. the king had shown great interest in aviation and, in October 1977, he began his theoretical and practical training in flying helicopters. On January 14, 1978, H.M. the King graduated as a helicopter pilot and from that moment worked relentlessly to establish the Bahrain Amiri Air Force. H.M. the king was enlisted as an honorary permanent member in the Helicopters Club, United Kingdom, on January 30, 1979, for his extensive contribution to aviation in the Middle East since 1977. H.M. the King has great interest in preserving heritage and continues to indulge in a number of sports activities and hobbies including falconry, golf, fishing, tennis and football, but H.M. primary interest has always been the continuous development and advancement of the Bahrain Defense Force to which he has allocated a great deal of time and effort. The Order of Bahrain (Wisam al-Bahrein) in the first class. The Medal of Military Merit (Wissam al-Khidmat al-Askari) of the Kingdom of Bahrain. Collar of the Order of Abdulaziz al Saud of the Kingdom of Saudi Arabia in the first class (April 4, 1967).